Australia was dismissed for 262 in 112.1 over while batting first and India scored 266 runs in 68.1 overs with two wickets left in their first innings. The second day’s play of the fourth and final Test concluded on Saturday, March 23, 2013, at Feroz Shah Kotla, Delhi. Earlier, the Kangaroos went into bat in the morning at 8-231 in 98 overs whereas Peter Siddle and James Pattinson were unbeaten at 47 and 11 runs respectively. Siddle achieved his maiden Test fifty in the second over of the day as Pattinson hit 2 fours in the 101st over. The hosts got the first breakthrough when Peter Siddle was clean bowled by Ravichandran Ashwin for 51 off 136 balls with 4 fours. James Pattinson and Nathan Lyon added 19 runs for the last wicket and took the score to 262 when the first was gone for 30 runs. Ravichandran Ashwin was the most impressive bowler with five wickets, Ishant Sharma and Ravindra Jadeja shared two whereas Pragyan Ojha claimed one wicket. Murali Vijay and Cheteshwar Pujara opened the innings for India in a commanding way as the first hit a four on the second ball her faced. 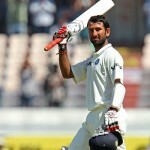 Pujara got 3 fours in the next couple of overs and the score went past the first fifty in the 10th over. Pujara was timing the ball nicely and kept on sending the ball over the rope regularly whereas Vijay was getting along well from the other end. Vijay survived two leg before wicket appeals as Cheteshwar Pujara reached his second Test half century in the 24th over. The openers provided a solid platform of 108 runs when the stumps of Cheteshwar Pujara were dislodged by Nathan Lyon for 52 off 76 balls with 5 fours. Virat Kohli became the second victim of Nathan Lyon after he was held lbw for just one run. The hosts lost their second wicket at 114 as Sachin Tendulkar walked in the center and Murali Vijay reached his third Test fifty in the 29th over. Tendulkar opened his account with a single on the 10th delivery and persisted with his innings even after two huge lbw shouts in the 32nd over. He dispatched his first four in the 38th over followed by two more in the next as Murali Vijay was caught behind by Matthew Wade off Peter Siddle for 57 from 123 balls with 8 fours. Ajinkya Rahane went out cheaply for seven runs and the fourth wicket was lost at 165 in 45.4 overs. The Indian skipper, MS Dhoni, got in next and was dropped at seven runs on the second ball of the 48th over by Steven Smith at backward short leg off Lyon. 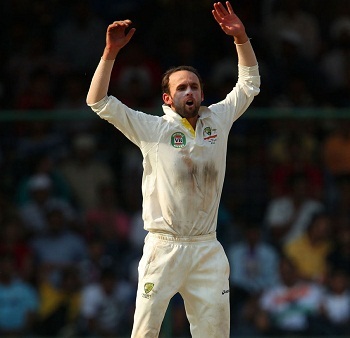 Nathan Lyon held a prize wicket of Sachin Tendulkar for 32 and was replaced by Ravindra Jadeja. The wickets kept on crumbling at regular intervals as Dhoni was caught at midwicket off James Pattinson for 24. Jadeja took charge and opted to play attacking cricket and was hitting the ball out of the fence repeatedly. The score was enhanced to 254 when he was declared lbw off Glenn Maxwell for 43 from 49 balls with 6 fours. India went past the first innings total of Australia in the 68th over with a four from Bhuvneshwar Kumar. India managed 266 runs for the loss of eight wickets in 68.1 overs whereas Kumar was holding his end for 10 and the new batsman has yet to arrive. Nathan Lyon was the star performer with the ball and grabbed five wickets whereas James Pattinson, Peter Siddle and Glenn Maxwell held one wicket each. The match is evenly poised with India having a little edge and Australia will anticipate wiping off the tail at the earliest.